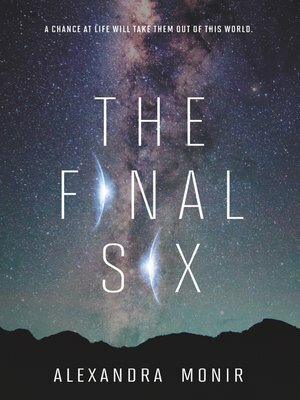 Set in the near future, this action-packed YA novel—already optioned by Sony Pictures—will take readers out of this world and on a quest to become one of six teens sent on a mission to Jupiter's moon. This is the next must-read for fans of Illuminae and The Martian. When Leo and Naomi are drafted, along with twenty-two of the world's brightest teenagers, into the International Space Training Camp, their lives are forever changed. Overnight, they become global celebrities in contention for one of the six slots to travel to Europa—Jupiter's moon—and establish a new colony, leaving their planet forever. With Earth irreparably damaged, the future of the human race rests on their shoulders. For Leo, an Italian championship swimmer, this kind of purpose is a reason to go on after losing his family. But Naomi, an Iranian-American science genius, is suspicious of the ISTC and the fact that a similar mission failed under mysterious circumstances, killing the astronauts onboard. She fears something equally sinister awaiting the Final Six beneath Europa's surface. In this cutthroat atmosphere, surrounded by strangers from around the world, Naomi finds an unexpected friend in Leo. As the training tests their limits, Naomi and Leo's relationship deepens with each life-altering experience they encounter. But it's only when the finalists become fewer and their destinies grow nearer that the two can fathom the full weight of everything at stake: the world, the stars, and their lives.